Correction: a reader indicates that ~2% is the amount of influence from the addition of many SNPs (often with a tiny estimated impact each), while ~0.2% is the amount of influence estimated for each of the three most influential SNPs, not together. I stand corrected (but still a very small influence). While the authors express themselves hopeful that this proportion will increase in the future, so far only three SNPs have been found with a clear correlation to educational attainment, representing 0.2% of all genetic influence. When they consider a linear polygenic score from all measured SNPs, they can’t still measure more than an elusive 2% of putative genetic causes for these differences. A genome-wide association study of educational attainment was conducted in a discovery sample of 101,069 individuals and a replication sample of 25,490. Three independent SNPs are genome-wide significant (rs9320913, rs11584700, rs4851266), and all three replicate. Estimated effects sizes are small (R2 ≈ 0.02%), approximately 1 month of schooling per allele. A linear polygenic score from all measured SNPs accounts for ≈ 2% of the variance in both educational attainment and cognitive function. Genes in the region of the loci have previously been associated with health, cognitive, and central nervous system phenotypes, and bioinformatics analyses suggest the involvement of the anterior caudate nucleus. These findings provide promising candidate SNPs for follow-up work, and our effect size estimates can anchor power analyses in social-science genetics. Seriously, if they could find no more than an elusive ~2% in more than 100,000 individuals… how do they expect to ever find any more? Let’s be honest: there is only very limited genetic influence on intelligence and cognitive or educational attainment, because, after all what genes do with the brain is to lay out the hardware, so to say, with all the software (but surely a basic emotional-instinctual ROM) being the product of environmental interaction. It’s possible that there is minor variance in the hardware (genetics) and maybe even more in its initial configuration (basic epigenetics) but, the same that most desktop computers can do the same things, with less important variability, human brains can too (unless somehow damaged). 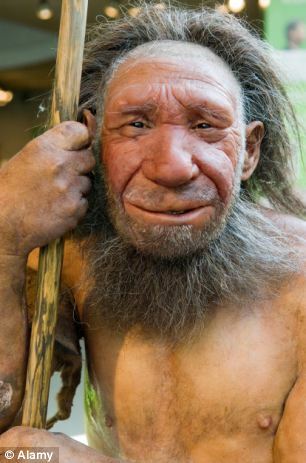 This is a generally well finished study on an allele shared by (some) modern humans, Neanderthals and “Denisovans” but which the authors properly gouge to be probably not Neanderthal in origin among us. Ancient population structure shaping contemporary genetic variation has been recently appreciated and has important implications regarding our understanding of the structure of modern human genomes. 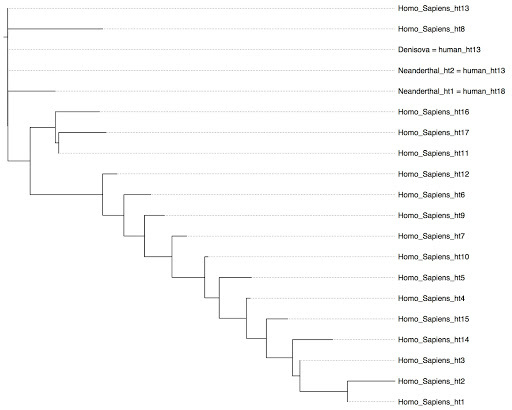 We identified a ~36-kb DNA segment in the human genome that displays an ancient substructure. The variation at this locus exists primarily as two highly divergent haplogroups. One of these haplogroups (the NE1 haplogroup) aligns with the Neandertal haplotype and contains a 4.6-kb deletion polymorphism in perfect linkage disequilibrium with 12 single nucleotide polymorphisms (SNPs) across diverse populations. The other haplogroup, which does not contain the 4.6-kb deletion, aligns with the chimpanzee haplotype and is likely ancestral. 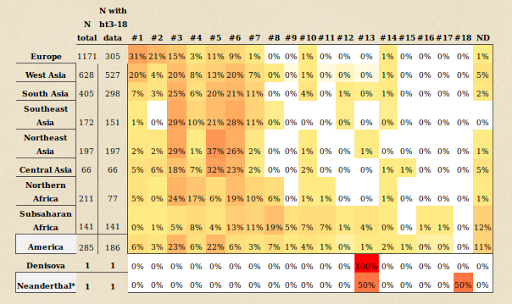 Africans have higher overall pairwise differences with the Neandertal haplotype than Eurasians do for this NE1 locus (p<10−15). 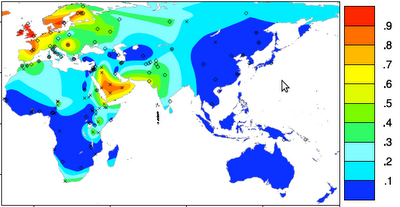 Moreover, the nucleotide diversity at this locus is higher in Eurasians than in Africans. These results mimic signatures of recent Neandertal admixture contributing to this locus. However, an in-depth assessment of the variation in this region across multiple populations reveals that African NE1 haplotypes, albeit rare, harbor more sequence variation than NE1 haplotypes found in Europeans, indicating an ancient African origin of this haplogroup and refuting recent Neandertal admixture. Population genetic analyses of the SNPs within each of these haplogroups, along with genome-wide comparisons revealed significant FST (p = 0.00003) and positive Tajima’s D (p = 0.00285) statistics, pointing to non-neutral evolution of this locus. The NE1 locus harbors no protein-coding genes, but contains transcribed sequences as well as sequences with putative regulatory function based on bioinformatic predictions and in vitro experiments. We postulate that the variation observed at this locus predates Human–Neandertal divergence and is evolving under balancing selection, especially among European populations. The paper discusses an allele (NE1) of APOBEC3G, a gene arguably related to anti-viral immunity, which is found primarily in its derived variant among non-Africans (especially South Asians, Europeans and Native Americans). In similar cases other similar studies have claimed that it should be a Neanderthal introgression, ignoring the presence of the relevant allele at low frequencies in Africa. The authors of this study do not commit this error but finding it at low frequencies not just among the Maasai and the Luhya but also among Pygmies, they consider that there is a high likelihood of the allele found among Eurasians and Native Americans to have originated among Homo sapiens in Africa and then maybe favored by natural selection or other mechanisms outside the ancestral continent. Figure 3. Ancient African origins of the NE1 haplogroup. Figure 4. Selection acting on the NE1 locus. between 400,000–800,000 years ago . While the Neanderthal-Sapiens divergence estimate they use (fig. 4A) is clearly more recent than I would gladly accept (I’m more into 1.3-0.9 Ma BP, based on archaeological and paleoanthropological data), it does not seem to matter for the conclusions, as they estimate that the two main haplotypes in chromosome 22 related to this allele diverged much earlier, at the beginnings of the history of the genus Homo. Chimpanzees by the way have the non-NE1 allele, which is therefore considered ancestral.